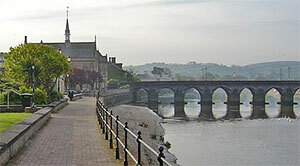 Barnstaple is a North Devon town some 34 miles (55 km) northwest of Exeter. The town grew up in the River Taw valley, 10 miles from the river mouth, and claims to be the oldest borough in the United Kingdom. It was certainly around when the Doomsday book was compiled; it then had its own mint. Before the river silted up, Barnstaple was a busy port and in Elizabethan times the good people of Barnstaple sent 5 ships to fight the Spanish Armada. Today, there are still traces of an old Norman Castle and a 16th-c sixteen-arch long bridge still crosses the Taw. Barnstaple enjoys a central location in North Devon and provides shopping facilities for the whole district. The town centre retains some interesting and impressive old buildings. Butchers Row consists of ten shops with stone pilasters and an overhanging roof with iron supports. The adjoining Victorian Pannier Market with its high glass and timber roof supported on iron columns has been voted one of the top ten food markets in Britain. The early 19th-c Guildhall retains a quiet dignity in the town centre, while down by the riverside sits the stately Queen Anne's Walk. The town is particularly known for its floral displays that brighten the streets each summer. It was once voted "the best blooming town in the world". The Guildhall is accessed through a gated archway in Butchers Row. It remains in use by the Town Council but is open for tours most Saturdays in the summer season. This fine listed merchant's exchange building was built in 1713. In the centre, below Queen Anne's statue, is the 'Tome Stone', a place where deals were struck "on the nail" before witnesses. In front of the walk is the site of the Elizabethan 'Great Quay'. Only a tree-covered mound (the old motte) and traces of a moat mark the spot where the Norman castle once stood. The surrounding park is a popular leisure spot. Situated near the clock tower on the square at the end of the Long Bridge, this museum relates much of the history of the area. The Tarka Trail is a 180 mile long walking and cycling trail that winds its way through Devon. It takes its name from a novel by Henry Williamson and the subsequent film which tells of the life and death of an otter in North Devon.